metronome, download, free, mac, software, metronomes, digital, web, metranome, metronom, metronome downr hotkeys. 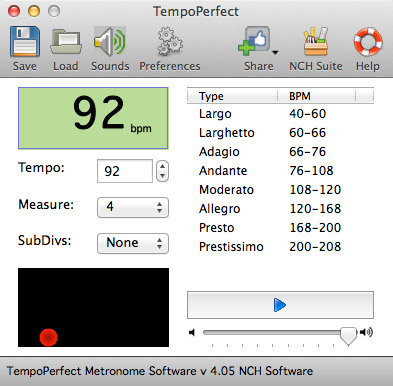 Unlike mechanical metronomes that wind down, TempoPerfect for Mac provides a clear and precise beat that can be accurately adjusted. TempoPerfect Free Computer Metronome runs on your Mac and can be controlled using your mouse or hot keys. TempoPerfect provides a clear and precise beat that can be acurately adjusted for the correct bpm, unlike mechanical metronomes that wind down. TempoPerfect for Mac is an essential tool for any musician. Designed to help musicians play in time, TempoPerfect creates beat patterns using a combination of accented beats and normal beats. For example, you can have 3+2 timing, or X-x-x-X-x visually. The bars first beat can also be emphasised by a unique sound. TempoPerfect features a visual beat indicator bar that bounces from left to right in time with the beat. This provides musicians with a very helpful visual cue. For those of us who cannot remember the correct bpm for a particular speed (eg. Allegro), TempoPerfect also includes a tempo guide in the main window. PM (allegro, presto, etc). Unlike mechanical metronomes, TempoPerfect for Mac never winds down and will keep a consistent and precise beat.